What Is DA Form 71? DA Form 71, Oath of Office - Military Personnel is a form that is used to create a record of the date of acceptance of appointment as an officer in the Army of the United States. The form must be completed by all newly-appointed officers. Failure to file will make the appointment invalid. The most recent version of the form - sometimes incorrectly referred to as the DD Form 71 - was released by the Department of the Army (DA) in July 1999 with all previous editions being obsolete. The form contains an oath of office which must be filled in, subscribed, attested and returned to the agency from which it was received. In case of non-acceptance, the form must be mailed back to that agency. Where Do I Find My DA Form 71? The Oath of Office form is unclassified and approved for public release with unlimited distribution. An up-to-date fillable DA Form 71 is available for download and online filing down below or can be found through the Army Publishing Directorate website. 5 USC 3331, 552, 552a; 10 USC 10204. PRINCIPAL PURPOSE: To create a record of the date of acceptance of appointment. date of acceptance of appointment is used in preparing statements of service and computing basic pay date. Completion of form is mandatory. Failure to do so will cause the appointment to be invalid. COMMISSIONED OFFICERS WILL ALSO SPECIFY THE BRANCH OF APPOINTMENT WHEN APPOINTED IN A SPECIAL BRANCH. the agency from which received, (by letter) indicating the fact of non-acceptance. which I am about to enter; SO HELP ME GOD. the left of his/her signature. subscribe the oath prescribed by 5 USC 3331.
or other proper local official. On approval of the appointment, the officers are therefore assigned to an appropriate branch. Branches are determined by the applicant's qualifications and the vacancies to fill. 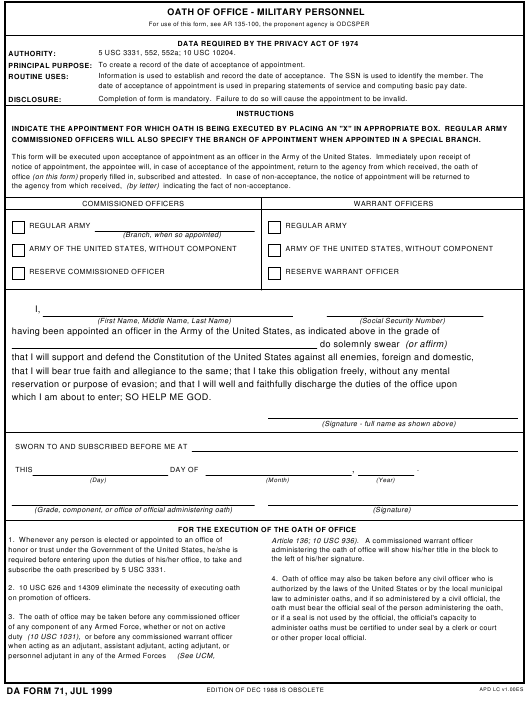 In case of being a former commissioned officer of any U.S. Armed Forces on AD in the Army in a WO or enlisted status and having the appropriate qualification, there are several options of accepting an appointment in a branch they were previously assigned to or to a branch in which a previous appointment was held. A memorandum of appointment and a DA Form 71 are to be issued and sent to each appointee for completion per instructions. A signed oath is required for appointment in any component of the Army. The execution and return of the form constitute the acceptance of appointment. No other evidence is required. When the appointment involves a WO or enlisted member of the Active Army, the oath requires specifying the current grade in parentheses under the address. The number of years, months and days credited after "D" on the memorandum of appointment must be indicated if credit for service in an active status based on education and experience is used to determine grade eligibility at the time of appointment. An oath of office executed with reservations of any nature or modification will not be recorded as an acceptance. In case no desire to execute an oath without reservations is expressed the appointment will be canceled.